First of all I assume you know basic of canvas. If not, don’t worry it is very easy and simple. Please learn from W3schools. Look at the picture. 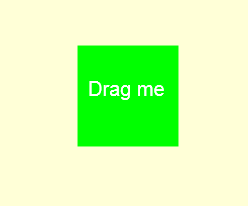 Here we want to drag a rectangular object and drop any where in the canvas. The new <audio> tag in HTML5 allows users to embed music(s) to their website applications. In this post we will discuss about <audio> tags and its APIs. Currently <audio> element supports only three formats of audio files. i.e. MP3, wav and ogg. And also not all browsers support all of the three formats. Before we proceed further we should know the MIME type of these three supported audio format. Because MIME helps browser in identifying the media. We often impressed by looking the outer beauty of any product that may be tangible or intangible. The same thing can happen with a website as well. An application or Website will reveal its beauty from its aesthetic design. Now days we adopt different framework to design a website. In ancient years, near about 8 to 10 years before, websites were designed in simple HTML static page. But later on revolutions started and some browser came to extend their hands to support and give life to the webpages and introduced the concept of dynamic webpages. Earlier it was difficult to design a graphics in simple HTML tag. Some format was not supported. So Adobe Inc. took one step ahead and introduced Flash and Flex to the graphics world. By the help of Flash we can design different animation in a shorter span of time. Some game application we can design quickly.